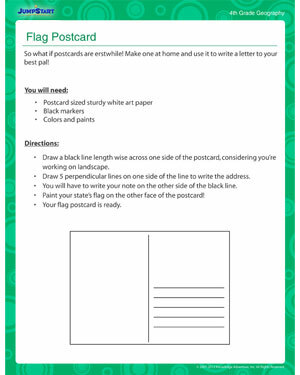 ‘Flag Postcard’ is a great geography activity that will keep kids glued for hours to it. A little bit of erstwhile craft and modern geography come together in this fun geography activity on JumpStart. Use the postcard to write letters to friends and can also be used in an interesting handwriting activity too. The activity is perfect for 4th grade kids who have been introduced to flags and maps a year back. Browse more related free geography printables online.